Vegetarians bug me. Somehow I ended up with several lovely friends who stick strictly to their veggies. Ugh. I don't consider a meal a meal, unless it has a LOT of fish, chicken or beef (or mounds of pork, which is my favorite) but Gourmet magazine pulled through again. A year ago, I found a vegetarian recipe that my vegetarian friends love, and my carnivorous family asks for all the time. (Proudest confession: I once fed 8 people this meal for $15.) So Heather, this is for you and your skinny vegetarian bootie. 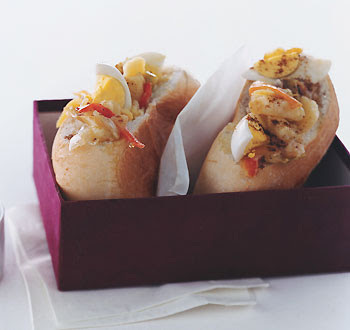 Moroccan Potato and Egg Sandwiches 4 large eggs Ground Cumin (This is important. Don't skip it.) 1 red bell pepper (sliced in thin 2 inch strips) 1 medium onion (diced) 2 large boiling potatoes (peeled and thinly sliced) Salt & Pepper Extra Virgin Olive Oil 4 Portuguese rolls (Ask for them. They are perfect and cost $.25!) 1. Boil water in medium sauce pan. Once boiling, place eggs in boiling water for 10 minutes. Remove from heat and run eggs under cool water. Peel eggs and slice into 4-6 sections. 2. Coat bottom of skillet with extra virgin olive oil. After oil has heated for about 1 minute, add red peppers, onion and potatoes, and season with salt, pepper and cumin. Stir occasionally until everything is tender (about 20 minutes.) 3. Mix eggs, peppers, potatoes and onions in a mixing bowl. 4. Rip off one corner of each roll and pull out bread from inside, creating a deep pocket. Fill with egg/pepper/potato mixture. 5. Eat with your hands.